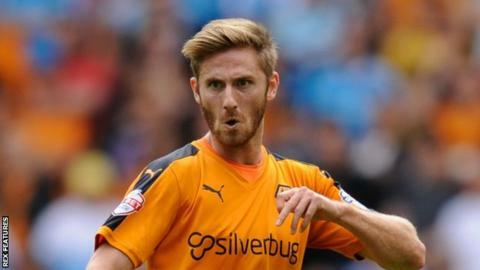 James Henry scored the only goal as Wolves beat Reading to win at home for the first time since 3 October. The loss was Brian McDermott's first since returning as Royals manager. Both teams had penalty calls turned down either side of Henry's winner against his former club, a header from Jordan Graham's free-kick. Reading's Oliver Norwood hit the post and Wolves keeper Carl Ikeme spilled a fierce Nick Blackman shot in the second half but the home team held on. Reading are 11th in the Championship, while the hosts moved up one place to 16th as they recorded their first three points at Molineux since winning 3-0 against Huddersfield. The visitors thought they had won an early penalty when Dominic Iorfa looked to have blocked Garath McCleary's shot with his arm, but referee Simon Hooper waved play on. Wolves have now won their past three Boxing Day matches without conceding a goal, after losing the three beforehand and conceding seven in the process. Benik Afobe had his own appeal for a penalty turned down after Henry's opener when he was brought down by Stephen Quinn, before the Wolves striker almost doubled their lead when he flicked Henry's cross onto the post. Norwood almost restored parity in fine fashion soon after the break when his 25-yard strike cannoned off the upright, while Michael Hector took advantage of Wolves' hesitancy when he nearly levelled at the far post. Some sustained pressure from Reading in the second half was very nearly rewarded when Blackman unleashed a fierce long-range shot that Ikeme spilled, but the ball somehow rolled narrowly wide. Wolves head coach Kenny Jackett: "We got our noses in front for the third successive game but here we showed some desire and organisation to hold onto it. "There was some spirit there as it has been a little bit of time since we have won at Molineux. "Hopefully we can build on this and certainly show the desire, organisation and will to win that we showed in the second period. "That has been lacking in recent games, certainly the last two when we conceded seven goals. That gives us no chance." Reading manager Brian McDermott: "I think if we had gone 1-0 up it is a different game. "We had lots of shots but maybe we need to work the ball into better areas, to get better crosses in and more quality. "But you can see the talent. I thought that we passed it really well and we controlled the second half and they got the result. "Obviously, the be-all and end-all is the results but sometimes you take something from the performance as well." Match ends, Wolverhampton Wanderers 1, Reading 0. Second Half ends, Wolverhampton Wanderers 1, Reading 0. Corner, Wolverhampton Wanderers. Conceded by Orlando Sá. Offside, Wolverhampton Wanderers. Matt Doherty tries a through ball, but Grant Holt is caught offside. Substitution, Wolverhampton Wanderers. Grant Holt replaces Benik Afobe. Attempt missed. Benik Afobe (Wolverhampton Wanderers) right footed shot from outside the box is close, but misses the top right corner. Assisted by Dave Edwards following a fast break. Corner, Reading. Conceded by Dominic Iorfa. Attempt missed. Hal Robson-Kanu (Reading) header from the centre of the box misses to the left. Assisted by Oliver Norwood. Attempt blocked. Ola John (Reading) right footed shot from outside the box is blocked. Assisted by Andrew Taylor. Attempt missed. Danny Williams (Reading) right footed shot from outside the box misses to the left. Attempt blocked. Nick Blackman (Reading) left footed shot from the right side of the box is blocked. Assisted by Hal Robson-Kanu. Attempt blocked. Danny Williams (Reading) right footed shot from outside the box is blocked. Attempt missed. Danny Williams (Reading) right footed shot from outside the box misses to the left. Assisted by Oliver Norwood following a corner. Corner, Reading. Conceded by Danny Batth. Substitution, Reading. Orlando Sá replaces Stephen Quinn. Attempt missed. Hal Robson-Kanu (Reading) left footed shot from outside the box misses to the left. Assisted by Stephen Quinn. Attempt missed. Danny Williams (Reading) right footed shot from outside the box is too high. Assisted by Stephen Quinn following a corner. Corner, Reading. Conceded by Carl Ikeme. Attempt saved. Nick Blackman (Reading) left footed shot from outside the box is saved in the centre of the goal. Assisted by Oliver Norwood. Corner, Reading. Conceded by Ethan Ebanks-Landell. Attempt blocked. Danny Williams (Reading) left footed shot from outside the box is blocked. Assisted by Oliver Norwood. Corner, Wolverhampton Wanderers. Conceded by Jonathan Bond. Corner, Wolverhampton Wanderers. Conceded by Andrew Taylor. Dominic Iorfa (Wolverhampton Wanderers) is shown the yellow card. Substitution, Reading. Andrew Taylor replaces Garath McCleary. Substitution, Reading. Ola John replaces Matej Vydra. Attempt missed. Michael Hector (Reading) right footed shot from the right side of the six yard box is close, but misses to the right. Assisted by Oliver Norwood following a set piece situation. Attempt missed. Hal Robson-Kanu (Reading) header from the right side of the box is too high. Assisted by Nick Blackman with a cross following a corner. Attempt blocked. Nick Blackman (Reading) left footed shot from the right side of the box is blocked. Assisted by Garath McCleary. Attempt saved. Matej Vydra (Reading) right footed shot from outside the box is saved in the centre of the goal. Assisted by Oliver Norwood.